Here at the R0b0tninja, sometimes the darts I throw are poison-tipped, and sometimes they are merely diamond coated. Nevertheless, enemies sometimes appear that require more attention than my hydraulic shurikens can deliver, and your friendly yet merciless robotic ninja can be waylaid by sonic potential, and promises of infinite energy. The people at Native Instruments, long discussed by your humble r0b0t narrator for their instrumental prowess, have unveiled Komplete 4, which is a plug-in based group of multiple synth, sampler and effects programs that, under the control of Kore, combine as one to form a giant R0b0t of musical destruction. Each synth on its own is a powerful weapon, much like the lions of Voltron, only these are easily capable of devouring entire skyscrapers, lengthwise, in their powerful jaws. Individually, the different plug-ins available are as follows: Absynth, Kontakt, Massive, Battery, FM8, B4, Pro-53, Akoustik and Elektrik piano, Guitar Rig, Vokater, Spectral delay, Kore and Reaktor. Together, these sonic blast-dragons, if you will, threaten to overtake mankind as the pinnacle of evolutionary intelligence, and, as with all of man’s tools, have the power to create as well as to destroy. This monstrous compilation of audio processing is too deep to be described collectively, and so, your R0b0t ninja has taken it upon himself to report, in detail, on the different qualities presented in each. 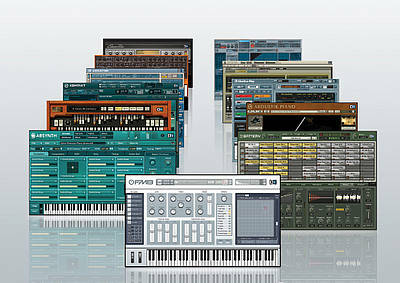 Some, (like absynth and reaktor), are available as 400 dollar programs alone. By themselves, they are like hand-held universes: fully accessible from our own dimension, yet so intricate and multi-faceted as to defy full definition. Attempting to combine them all and successfully express their true power to the uninitiated would be like explaining the brilliance of Rembrandt to a blind man with no ears. Not completely impossible, but nonetheless, a thoroughly ridiculous task. Anyway, in the coming weeks, expect to find new updates of this herculean process on the R0b0tninja post, and watch this new audio potential affect change within my dub and hiphop galaxies. I will begin with Absynth (as recent trends would have us follow), and give you a basic walkthrough that, when shown to the beasts of the field, will grant them instant comprehension of the universe and its workings. Unfortunately, all others will gain only a topical understanding of modern synthesis and sampling techniques.